Posted by Rutger on 2016/04/29 . Leave a comment. Part of the lecture series Den Rättvisa Staden, hosted by ABF Stockholm in collaboration with the School of Architecture, KTH, coordinated by Catharina Gabrielsson. Stockholm is awash with advertising promising visions of a happy, mindful, sustainable, and successful life… If you buy into the real-estate dream. Rather than sound plans, precise detailing, formal eloquence, or long-term affordability, architecture is increasingly sold to clients, governments and inhabitants on the basis of glossy visualizations and lifestyle branding. What are the implications of architecture’s obsession with its own image? What kind of life are we really being promised, and at what cost? Finally, can practices of image production in architecture (rendered, montaged, or other) be retooled to produce progressive, emancipatory, and even radical change? 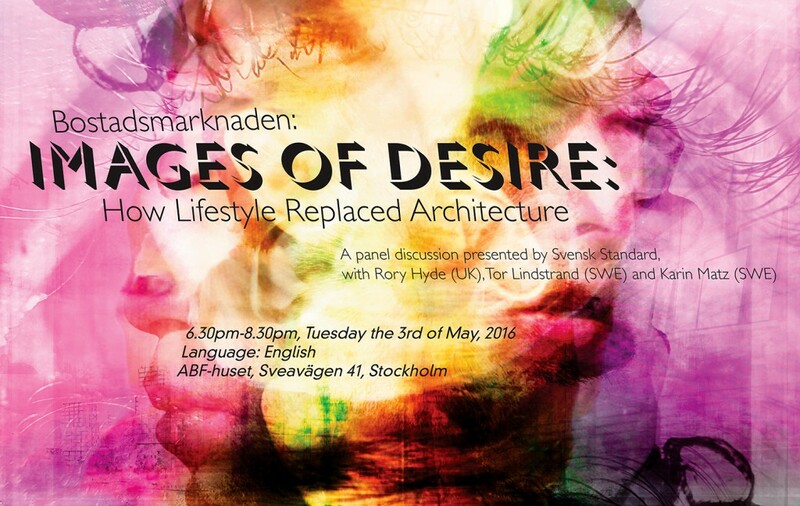 Svensk Standard, with the support of the Swedish Schools of Architectural Research (ResArc) and Critical Studies in Architecture at the KTH School of Architecture, presents a panel of architects and critics who will, over the course of 120 minutes, attempt to get to the bottom of “how lifestyle replaced architecture” and what must be done. Rory Hyde (UK) is Curator of Contemporary Architecture and Urbanism at the Victoria and Albert Museum, London, where he is currently curating a major exhibition on the future of design to open in 2017. He studied architecture at RMIT University in Melbourne, where he also completed a PhD on emerging models of practice enabled by new technologies. He is currently Adjunct Senior Fellow with the University of Melbourne. His first book Future Practice: Conversations from the Edge of Architecture (Routledge, 2012) was awarded the AIA prize for architecture in the media. Tor Lindstrand (SWE) is an architect and Assistant Professor at the KTH School of Architecture. His practice oscillate between architecture, art and performance and has been presented in numerous cultural contexts. Tor Lindstrand is an architecture critic for FORM magazine and involved in the collaborative research project Power, Space and Ideology at Södertörn University. Karin Matz (SWE) is an architect and teacher, whose work has been published in Arkitektur, FRAME Magazine, Casa Vogue, domus, Baumeister, Corriere della Sera, and Abitare. Through Karin Matz Arkitekt, she has designed to completion a series of smaller residential projects and interiors. Karin also teaches within the Masters of Architecture at the KTH School of Architecture (2013 – present) and works at the office Vera Arkitekter (2012 – present), where she is currently Project Architect for Kv. Cellen in Hagastaden, a mixed-use development over a total of 33,000 square meters.